Fire hose reel course for the training and examination of fire hose reel service technicians. This course covers routine inspection and maintenance of fire hose reels prescribed by BS EN671-3: 2009 and is designed to prepare the candidate for the examination. 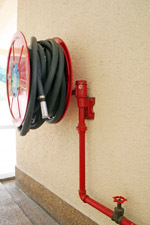 It does not include the installation or repair of fire hose reels. This one day course is ideal for anyone wishing to undertake (and become a ‘competent person’ in) the selection and maintenance of fire hose reels. The fire hose reel course includes a practical element to enhance the training and test competence.